BARE BONES® LOW ODOR is a superior floor stripping formula that can be used anywhere, anytime! Like the original BARE BONES that set the standard for performance and labor savings some 20 years ago, BARE BONES® LOW ODOR from NCL provides the same rapid penetration and complete removal of even heavily burnished floor finish in a low odor formula that can be used in hospitals, schools and universities and office buildings. NCL chemists have designed a wetting system that keeps BARE BONES® LOW ODOR working at maximum effectiveness, with powerful film removing action easily cuts through multiple layers of finish easily! 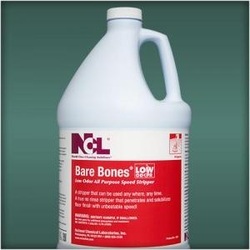 BARE BONES® LOW ODOR is a must for all professional floor care systems. Bolt is an ultra concentrated formula that quickly penetrates and removes even extreme floor finish build-up. Excellent wetting and slow drying features save time and labor. Compared to leading floor strippers Bolt™ is 2 to 4 times more active. It contains no caustics, and does not require a neutralizing flood rinse.